Even before London Grip has given its opinion, this book has been featured in the national press. Released just in time for the Labour Party conference, it attracted notice in the parts of the papers that other poetry books seldom reach. This moment in the headlines – brief though it was – is a mild encouragement both for poetry in general and also for those who still nurse hopes that Jeremy Corbyn can reshape the Labour Party into an effective opposition and even a party of government. 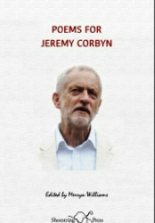 So what are these ‘Poems for Jeremy Corbyn’? Well, some of them – let’s call them appreciations – pay him gracious compliments. Others might be labelled advocacies because they stand up for him against those who oppose or obstruct him whether in the media or in Westminster. Then again there are those – and these I think are the most interesting – which offer some kind of advice by addressing policies which Corbyn has proposed (or which the poet thinks he should propose). the lazy tricks that served for years. ‘On your unsuitability for high office’ recognizes that press attacks begin as soon as they realise / you might succeed in changing/more than the occasional / light bulb. tell us lies about the Trade Deal plans. This comes from ‘Tell me lies about the austerity plan’ – which is of course a (well-done) pastiche of Adrian Mitchell’s famous ‘Tell me lies about Vietnam’. It does not limit itself to attacking the Conservatives but – like several other pieces in the anthology – also engages in retrospective criticism of ‘Blairites’ and Tony Blair’s legacy. Deep inside, some parts of us are pink! ‘Maiden Speech’ appears to take on the political elite’s blind faith in neo-liberal capitalism; and ‘A Scream in 1890’ reminds us of Victorian factory conditions which current economic theories may be ready to justify all over again. ‘The Anthropocene’ tackles the even grosser blindness to climate change by mocking the feeble refrain how were we to know? Meanwhile ‘The Blame’ skewers a very English problem: Bloody class. The common bloody shame. These few brief extracts should give an impression that this is a varied and lively selection of poems seeking wholeheartedly to engage with issues that genuinely matter. This is a truthful impression; and yet I could wish the book felt a little less ‘well-behaved’. It is perhaps unfortunate that I recently visited the V & A exhibition You Say You Want a Revolution? and could not help contrasting the extravagant (and, yes, sometimes silly) enthusiasm for change in the 1960s with the more muted and passive responses in the country at large in the face of current causes of discontent. I would have liked to find more pages in this anthology crackling with fire and passion. There are certainly sparks and flashes – not least in the Mitchell and Sondheim pastiche pieces. But these also have an unintended consequence of slightly overshadowing other poems in the book by reminding us what magnificently memorable results can be achieved when fine poets/lyricists turn their imagination and language skills loose on big issues. All that being said, however, this is a book to be welcomed and one to be read and re-read because the poems have a cumulative effect. It should also be seen as a model and an encouragement to other poets and publishers to get some well-crafted rhetoric out into the world of political debate. There have been precious few ‘fine words’ in recent campaigning.